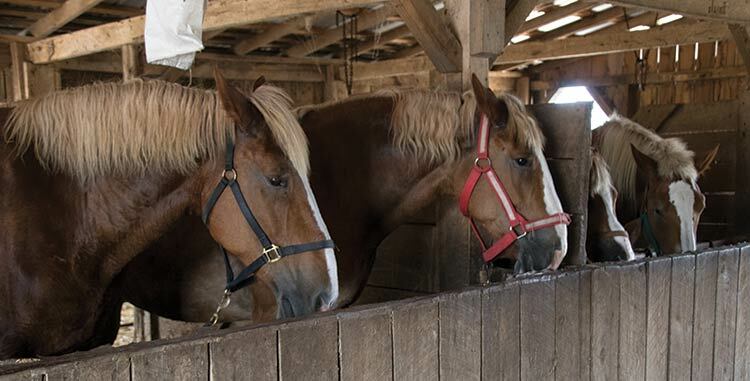 The phrase seemed only fitting coming from Steve Carr, owner of 3D Valley Farms in Depauw, Ind., as he tended to the draft horse team he still uses around the farm. Sure enough, it does work for him. 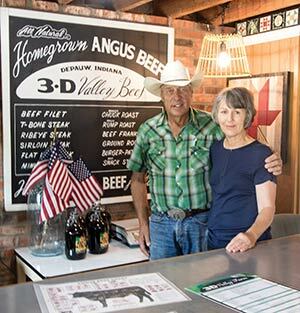 Carr and his wife, Jane, have been very successful in direct marketing their naturally raised and grass-fed Angus beef herd. Carr, who started out with 240 acres and his own brood cows around 1980, entered into the stocker business to boost his income. For the next 25 years, he fed about 2,000 stocker cattle a year on 750 acres. It was during this time that Carr really gained an appreciation for quality forage, after looking at the in and out weights of the growing cattle. When their daughters left for college, the Carrs found that diversification allowed them to cut down on the farmwork. It was Jane’s idea to get back into backgrounding and owning their own cattle to have more control of the source. Now with 890 acres, the Carrs are grazing 200 brood cows and have 500 animals on the farm at all times. With diversification came the opportunity to add value by marketing a portion of the herd as grass-finished beef. Carr likes to keep the operation simple, stating that the herd can go both ways — he can either bring them in and feed them non-GMO grain or finish them out on grass. Grass-finished cattle are brought up to 1,200 pounds on alfalfa pastures and processed at 22 months. Although Carr remarked that he would love to put 200 to 300 head of strictly grass-finished cattle together and ship them all out at once, the demand simply isn’t there for the premium that he is currently getting through staggering finished animals to meet demand. Carr is confident that he is on the right track as his grass-finished business grows each year. 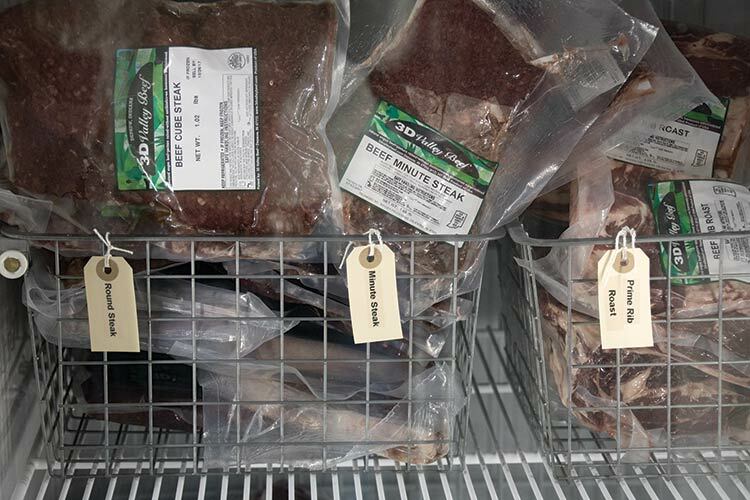 While the hanging weight and dressing percentage are lower on grass-fed animals, the premium for this value-added product gives room for expanding the operation as they see fit. While grass-finished cattle only represent 10 percent of his business, the grain-finished cattle are also spending 85 to 90 percent of their lives on pasture. Although he hopes to eventually graze year-round, last year Carr only had to provide stored feed for 90 days. He knows that quality forages make quality beef. “We’ve been doing grass finishing for the past six years, maybe seven, but what we’ve learned is we’ve got to keep these cattle on a higher quality diet,” Carr said. For this, Carr relies on alfalfa to get him through the summer. Calling it his drought insurance plan, Carr notes that he is able to graze while neighbors affected by drought will be feeding hay. Carr has around 100 acres of alfalfa that is made into a first cutting of hay, then it is rotationally or strip grazed the remainder of the year. He credits his quality alfalfa pastures for the added palatability of his products. Carr has also found success in no-till drilling cereal rye into his alfalfa, providing early spring forage. After early spring rains prevented his herd from grazing the first year, he ended up baling the rye in late April. He has found that making a first cutting and wrapping it as baleage works better as it is often too hard getting cattle on the fields after wet weather, and the rye would end up smothering the alfalfa if not taken off early. Thirty days after harvesting the rye, the alfalfa is ready to start grazing, which is generally about June 1. These alfalfa fields are grazed until September 15, when more rye is no-tilled into the alfalfa for fall grazing. The cattle return November 1 to graze rye until they are put on baleage for the winter. Carr remarked that after using this stockpiled baleage, his cattle came through the winter in their best shape yet with no store-bought protein. Though bloat is a concern with his alfalfa pastures, Carr is able to alleviate this simply by managing how his cattle graze. In addition to the first cutting coming off the field as hay, his pastures are subdivided into smaller paddocks that the cattle are rotated through daily. Furthermore, he turns his cattle out in the early afternoon when the dew is off and makes sure they don’t go in hungry. “I want to see a little bit left out there. That tells me that the cattle are full and getting everything they need, but I want it to look pretty much like a cut hayfield — I don’t want hungry cattle,” Carr added. Carr works his Angus herd, ensuring that good pasture is always available. He no-tills cereal rye into his alfalfa pastures for both fall grazing and to cut for baleage in the spring. 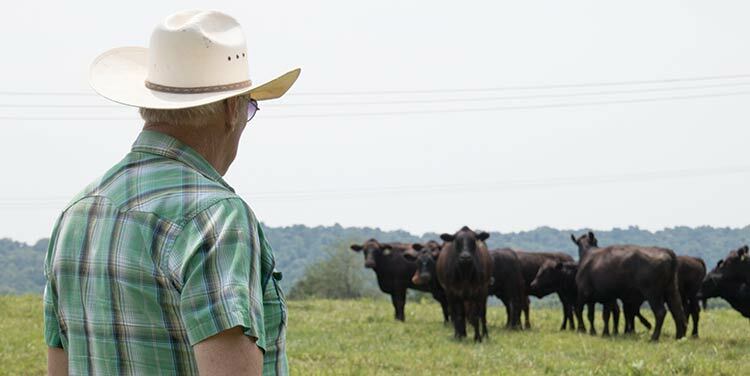 Raising cattle in the foothills of southern Indiana has one notorious limiting factor — an abundance of Kentucky 31 tall fescue. Carr turns bulls out in December and January in order to enhance conception rate and also ensure that the calves are off of the cow by summer, lowering its nutritional requirements. He also shared that maintaining a 50 percent stand of clover in his fescue pastures has helped tremendously. He rotationally grazes the cow portion of his herd on this mix of fescue, clover, and orchardgrass year-round, while his weaned calves and replacement heifers strip graze alfalfa pastures. “I like to move cows once a day, and when they get ready to leave that area, I like to see the tall grass flat on the ground,” stated Carr, who won the Indiana Forage Council’s Forage Spokesperson contest in 2016. Calling that philosophy another portion of his drought management plan, Carr maintains that this is actively adding organic matter back into the soil and retains moisture by shading the ground. Through this method, he has seen better quality forages develop and different species of grasses growing in his fescue fields. Carr credits the farm’s success with direct marketing to Jane’s understanding of consumer needs. They started by selling their products at a farmers’ market. Although skeptical at first, they were met with positive reactions and a very loyal customer base. “I told Steve ‘Hey, that’s your thing,’” Jane recalled. “Then I went with him a couple times and saw that there was interest in this. When a customer comes back and buys a second time, that’s the biggest compliment you can get,” she added. Customers now can find the Carrs’ products at two farmers’ markets, three smaller grocery stores, restaurants, online, or by coming to the farm’s own on-site store. That said, most of their business still relies on attending the farmers’ markets every Friday and Saturday. Jane admits that it is well worth the hard work when the product is able to sell itself. The two explained that they really fell into this niche market by being able to address consumer needs. After listening to the consumer, the Carrs started producing a product that is certified humane, hormone free, and without antibiotics. Although the Carrs draw most of their income from cattle, their business also markets additional naturally sourced products. They tap their own maple trees for syrup and market pork products from a nearby farmer with the same production guidelines as their own. Their daughter also raises free-range chickens that forage among the cattle and their eggs are a customer favorite. “People comment about what a difference that bright, rich yellow yolk is compared to other eggs they’ve bought,” said Jane of their alfalfa-fed chickens, noting that they do receive very limited amounts of non-GMO grain. While Carr and his wife are currently the only full-time employees, their goal is to pass the farm on to the next generation. The operation has brought two daughters back to the farm to work part time as they raise families. With the next generation preparing to take over, the future of 3D Valley Farms looks sustainable — to say the least. This article appeared in the January 2018 issue of Hay & Forage Grower on pages 8 to 10.